Obituary – Johnson, Catherine Francis (Schieffer) « Perry High School Alumni Association, Inc.
﻿- 18, is the daughter of Frank Schieffer of route 1, Perry. She was born in this city in July, 1926. Cooper and Pleasant View schools were the grade schools attended by this student before she enrolled in the Perry junior-senior high school. She plans to work in a grocery store after graduation. 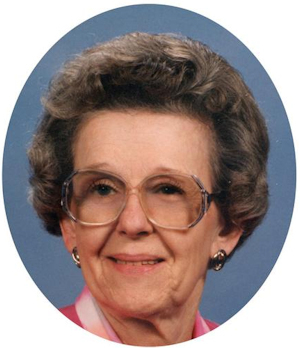 Catherine Francis (Schieffer) Johnson, 87, of Perry, Oklahoma, was born on July 21, 1926 in Perry, Oklahoma to Frank Joseph and Rose (Ableidinger) Schieffer. She passed away on Tuesday, October 8, 2013 at home in Perry, Oklahoma. Catherine was a lifelong member of the St. Rose of Lima Catholic Church in Perry, where she was active in the Altar Society. She and Ralph M. Johnson were married on July 21, 1945 in Perry, Oklahoma. They were married for 54 years until Ralph’s passing on June 6, 2000. Catherine was a homemaker. She enjoyed sewing and spending time with her friends and grandchildren. Above all, she loved her family and church. A Rosary will be held Thursday, October 10, 2013 at 7:00 p.m.at the St. Rose of Lima Catholic Church in Perry, Oklahoma. Mass of Christian Burial will be held Friday, October 11, 2013 at 10:00 a. m. at St. Rose of Lima Catholic Church in Perry, Oklahoma. Father Mariyanandam “Mario” Pulugujju will officiate. Interment will be at St. Rose of Lima Catholic Cemetery in Perry. Services are under the direction of Brown-Dugger Funeral Home in Perry, Oklahoma. Memorials may be made to the St. Rose of Lima Catholic Church or Judith Karman Hospice, in care of Brown-Dugger Funeral Home, 1010 N. 7th Street, Perry, Oklahoma 73077. Catherine is survived by two sons, Ralph Johnson, Jr. and his wife, Darla, of Perry, and Ronald Johnson and his wife, Lori of Orlando, Oklahoma; two daughters, Peggy Skluzacek and her husband, Jim of Perry, and Patricia Lott and her husband, Gene of Kingfisher, Oklahoma; one sister, Phil Saha of Houston, Texas; numerous grandchildren and great-grandchildren. She was preceded in death by her husband, Ralph; parents, Frank and Rose Schieffer; and one sister, Joan Schultz.